Many elderly adults eventually rely on family caregivers and home care aides for even the smallest things like getting dressed or cooking meals. Losing their independence and having to slow down their life can be hard, physically and emotionally. As they lose mobility, they often must let go of hobbies and activities they once enjoyed. That’s why it’s important for elderly adults to develop or maintain hobbies and interests that they can enjoy and share with others. 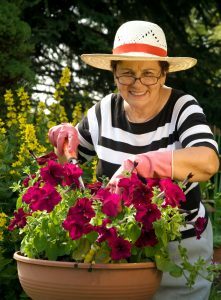 Container gardening is a wonderful activity that provides lots of benefits to seniors, both physically and emotionally. It doesn’t matter if they’ve never gardened before or if they are garden experts, container gardening is the type of hobby that can be adapted to all types of abilities. Physical Benefits of Container Gardening. It’s all too easy for elderly adults to stay sitting inside watching television instead of being active. With container gardening, they have the chance to be outside in the sunshine and fresh air. Digging, lifting, watering, pruning, and moving from container to container gets them up and moving, sometimes for an hour or more. Even light exercise and activity benefits elderly adults, improving their core strength, giving them better balance and more confidence in their movements. Of course, family caregivers and home care assistants should watch for signs of overexertion, heat stress, and dehydration. There are many other physical benefits to container gardening. Studies also show that gardening is a wonderful stress reliever and can lower blood pressure as well. Exposure to sunlight boosts vitamin D in the body and container gardening is also excellent for their fine motor skills. Of course, seniors also get to boost their nutritional intake when they enjoy the results of their labor with fresh vegetables and fruits they’ve grown themselves. Emotional Benefits of Container Gardening. There are plenty of emotional benefits of container gardening for elderly adults. They often feel frustrated or sad about the changes in their lives, especially being dependent on family members and senior care aides. Container gardening is a wonderful way for them to have a hobby that they can do independently and take pride in. Gardening can provide a real sense of purpose and boost their self-esteem as they work toward success. Container gardening can also help with social interaction. They can have conversations with their senior care aide, plant things with grandchildren or share the harvest with neighbors. Container gardens can also be good for the environment, especially if they plant flowers that attract hummingbirds, butterflies and bees. Knowing they are doing their part to boost the local ecosystem can help seniors feel good about themselves. When an elderly person is struggling with challenges from illness, injury, chronic issues, or simply the decline of old age, they may benefit both physically and emotionally from a container garden. Developing this hobby can provide them with several benefits that they can enjoy for years to come. If you or an aging loved one are considering caregiver services in Holmdel Township, NJ, please contact the caring staff at Lares Home Care 888-492-3538 or 732-566-1112.